my first name is YongSan and last : Akihabara . ofcourse several alias including Best Buy, CompUSA, Fry’s and even Circuit City past – where the American counterparts make-up with a good three-dozen branch-buildings throughout a massive continent, against Asian building-block districts in immensely populated areas . I can roam here at YongSan Electronics Market District for days, heck even live here for enough restaurants operate to feed those who work here, although Japanese counterparts, even at Den-Den Town in Southern second city of Osaka has better eateries geared for the visitor, which YongSan do NOT have aside from iPark Mall atop YongSan KTX Station at its Southern entrance . for the humble family-operated restaurants on top of JeonJa Landu (Electronics Land) do not compare with full-blown restaurants on higher floors of Japan’s newer electronics buildings Yodobashi Umeda and Akiba . aside from this, most eateries for those who work here are concentrated one alley North behind the main intersection behind Najin SangGa (translated as Market). my consciousness is always in sync with these electronic super-stores, truthfully the ultimate silicon heaven on Planet Earth, where current ruling beings can have a bulk of its materiel with pure money . further-more over the Millennium its scale enlarged in uncomparable proportions, but still made easier for consumers to find on the World Wide Web . I Seasonally note my own Almanac (updated below) as these hardware havens shift to meet with evolving digital times, and am preparing a guide-book thus here only revealing a tipsy point of the Kryptonic iceburg ..
first : the external borders of Capital of Seoul has been growing many times-fold since it was originally centered within the monumental “Great Gates” (for example : “NamDaeMoon” = Great South Gate and “DongDaeMoon” = Great East Gate). cities in South Korea are divided into “Ku”, where in turn is dissected into smaller “Dong”. a large portion of such “Ku” occupying the South-West of old Seoul is YongSan-Ku . then the U.S. Army took over what is now prime real estate property, including schools and housing for D.O.D. dependents as well as a golf course and United Nations Command . U.S. bases in mid-Peninsula including the current garrison scheduled to move to PyongTaek, considered a satellite city South-West of Seoul limits, beginning 2012~3 seems to be delayed another 5 years . SaeWoonSanga – a Wonder of its time in South Korea’s Golden Age ..
the major Electronics District in Seoul serving all of South Korea was originally located smack in the middle of downtown Seoul in JongRo, in a long~North-South block stretch of buildings called SaeWoonSangGa built in 1968, as Korea’s first multi-purpose building prided by then President Park . it contained endless myriad of stores in dissected booths then a bowling alley (then, a chic-sport reserved for the rich) , hotel (in a multi-complex ? the concept was purely incredible ! 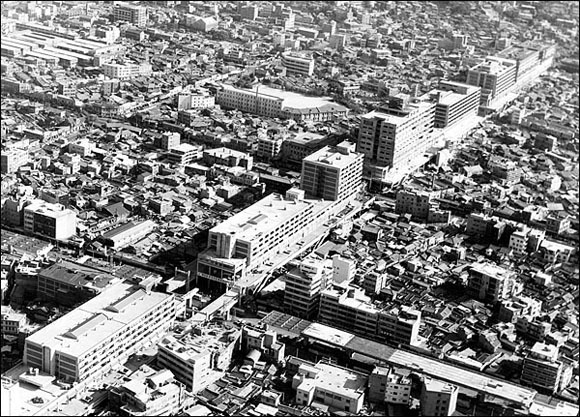 back-then) and the again-then residential apartments on upper floors (geared towards the early Western-influenced citizens) – much like neighboring Japan where corporations operating train AND subway routes built department stores AND hotels on top of AND underneath mega-train stations ! this was a time still recovering from the Korean War between North & South backed by USSR & US, and as you can see from the black-and-white photo : Central Capital is still barren and flat with this line of buildings protruding .. hailing a time when technology would save a large part of this land . and since technology was in its infant or rather unborne stage, more of interest to the general population were the “Ghost” underground markets in “NamDaeMoon” translated as South Gate, where food rations and liquor from the US Base was prize, and “KkangTtong ShiJang” = Cans (from bean cans fro GI’s) Market South in the Port City of Busan or “Pusan” back then, where goods were smuggle across the channel from neighboring Japan . as Seoul city boundaries began to expand, a bulk of its consumer electronic stores started relocating West-ward to YongSan on 1987, and gradually its role in the new land as a full-fledged Electronics District from 1995 . the old complex still exist today in fragment of torn walls where the ground floors are still dedicated to B2B electronics for business such as professional music instruments (more production end than guitars and keyboards) AND spying infiltration gear . upper floors gear to low-cost business offices (quite depressing when I visited on 2011). this whole area of JongRo, CheonGaeCheon AND UlJiRo roads spanning West-East in the Eastern sector of the old downtown Seoul comprise of wholesale stores serving a wide range of industries including plastic board-signs and house interior parts such as bathroom tiles . then textiles wholesale begin East-ward from here towards DongDaeMun, the ancient East Gate . Subway Line 1 YongSan Station Exit 2 will lead you to a long~ corridor connecting to the 3rd floor of Bus Terminal Market mention at the bottom of this page . but again before exiting this subway station you might want to look around this whole complex of YongSan KTX Station, iPark Mall, CGV movie Theatre and eMart . KTX bullet trains from KwangJu and DaeJeon stop here instead of Seoul KTX Station, a mere TWO subway stations North, serving the South-Eastern port city of Busan (Pusan) and DaeGu or TaeGu (older spelling prior to 1988 Seoul Olympics ) . so go into the station-mall complex and through, to reach Electronics Market . as you will have to go through one of the few Red Light Districts (with downright prostitution) left in the decent Capital of Seoul on either alleys in between (update : this has been demolished Spring 2012). AND a short 7 blocks ahead : YongSan Branch of the local telephone company AND cellular carrier KT . Subway Line 6 HyoChang OonDongJang (sports stadium) Exit 3, turn around and take the Left road straight, and after 3 large blocks at an ‘x’ intersection turn Left, and walk a while straight for 2 large crossing where you will reach Lotteria (Korean MacDonald’s) onto your Right . 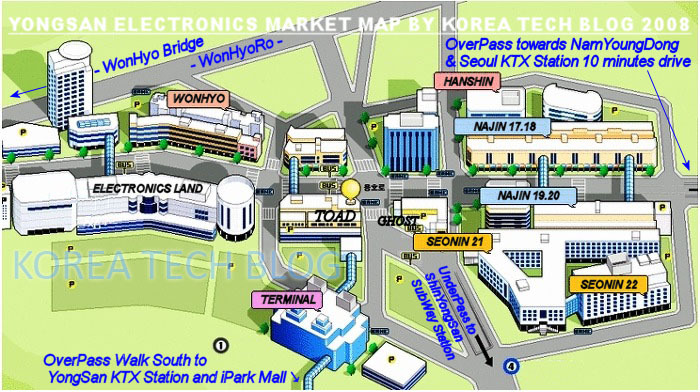 then you are dead center of all things Electronics in YongSan, ditto Seoul and all of Koreas 😉 center crossing of my small map way~ below . this is a nice walk if you wanna see the humble local store life on the way – about 10~15 minutes walk . in the early days when migrated from above SaeWoonSangGa, a bulk of business was centered around household electric appliances but a boost came as PC Rooms – where you pay roughly W1000 by the hour for a PC to play interactive games – took the country by storm in 1998, every prospecting owner seeked YongSan Electronics Market to order computers by the bulk . although much smaller scale in comparison with Japan : namely Akihabara Electronics District in Tokyo and Den Den Town in Osaka, where larger areas are cramped with larger and higher buildings . the two Japanese Districts are more like their other general Department Stores, while the Korean counterpart is more like an open market, indoors . aside from Electronics Land and Bus Terminal Market below which look like small department stores, stores in the rest of the buildings are more like a crabby exhibition booth, like the electronics-dedicated buildings in Hong Kong or China . if you seek clean department store-like surroundings aside from Electronic Land it can be found if you walk across the high-overpass that links Southern Terminal SangGa at the bottom of my mini-map below, onto YongSan KTX Train Station Shopping Complex, whose Western block consist of another electronics-dedicated building in i-Park Mall . unless listed as an official branch of major manufacturers, most (even those hailing large signs of these brand names) are independent sellers who get merchandise from suppliers, meaning they have their own code of pricing, returns & refunds . the slick-looking department store-type building each stores hire young temporary salespeople badly nicked “PPickki” to lure customers with a slash discount of a product they don’t have .. only to convince you to buy another once you come into their booth . the slumber booths in the torn-down buildings don’t resort to these tactics because many are wholesale – distributing to the stores mentioned before – thus would be worth your while to check out if you have the time . best only to venture into these territory to try the merchandise on hand, and then buy from a selection of Internet Shopping Malls where you can compare the whole price-range – with insured policy of refund and exchange . larger manufacturers such as the local SamSung, LG, Philipps and Sony have their own showrooms AND support centers (called “A/S” in Korea) not much in YongSan but much more in scattered locations around the Capital of Seoul and other cities . however, like in the States, buying directly from manufacturers is a tad expensive (aprox.5%) than from buying from their contracted sellers . it all consist of several dedicated buildings with different characteristics and expected clientele and would take a whole day to shop around all (big difference, since the Japanese counterparts would take more than 3~4 days and still more to go). (4) while the UnderPass leads to ShinYongSan Station of SEOUL Subway Line 4 .
say to the taxi driver : “YongSan JeonJa-Landu” and you are there . and comprised of 2 wide buildings : the original East Wing (called “Goo-Gwan” in Korean) and the new West Wing (“Shin-Gwan”). the two buildings are inter-connected so it will look like a single building from outside . very clean shopping atmosphere like a department store . ideally I would go here for household appliances or notebooks . this is their largest where they operate smaller electonics-dedicated buildings in corners of major road intersections throughout the Penninsula, almost alike SamSung and LG Show Rooms, but they carry many brands whereas the latters carry only their own . the price is competitive slightly over rock-bottom Internet Shopping Malls but a lot discounted than SamSung and LG Show Rooms which have to sell by retail prices . across the West Wing building to the West where HP Hewlett-Packard had a Support Center on the ground level, has since moved into Bus Terminal SangGa introduced at the end of this page . mostly consisting of support centers for consumer products as well as parts . and computer products support center for SamSung Electronics on the building across to the West, 2nd floor . the frontal shops on the ground floor roadside, mostly sell lighting products . behind this complex to the North until ‘WonHyo Ro’ Road lies independent buildings of varying size adhering to headquarters of individual electonics companies that buy AND sell goods in this whole area . at the Eastern endof the YongSan Electronic District on both sides of the road just before the overpath road heading towards Seoul KTX Train Station, is NaJin SangGa (Market) 17 & 18 Dong . this is a set of 3-story buildings cramped with countless small booths of wholesale stores who supply to the consumer markets I mention here . looking at it would remind you of an old apartment complex in Hong Kong . connected triangular building just South to this is the revered SeonIn SangGa (Market) 21 Dong Building, which “moves” the consumer computer market in Seoul, so the whole country . would you believe the tiny shops in this building are where the bulk of computers are bought or ordered in all of South Korea ? now these are points-of-sale – meaning their warehouses or suppliers all scattered throughout close-by other SeonIn and NaJin Buildings . they sell AND buy everything computer-related including laptops (now called notebooks because of its shrinking size & weight) delivery boys are always jumping in & out of this 4-story building . this is THE ideal place in all of Korea for putting together your beloved Personal Computer parts . most of popular Internet Shopping Malls specializing in computer & pheripherals take shop on the 3rd & 4th floors, while off-line stores are on the 2nd & ground levels, then small parts & accessories such as memory & fans on the underground level . inter-connected and right behind this building is 23 Dong of the same complex, with much higher floors, comprised of smaller on-line shopping malls and suppliers . I should note that both NaJin SangGa and SeonIn Sanga above are comprised of several buildings which form their whole complex . I have therefore mentioned the exact building numbers noted in “Dong” . at the South end of YongSan Electronic District is Bus Terminal SangGa (Market) called so, because this actually used to be a Bus Terminal serving outer-city limits, now moved to more remote locations since the capital of Seoul boundaries have expanded beyond belief . 2nd & 3rd floor : notebooks and portables such as Electronic Dictionary & Navigation Systems . * both HP Hewlett-Packard above and TG Sambo below, have since relocated just a block North-West to Electronics Land noted above . some of their branches take care of Dell laptops and here also HTC Android cell phones including Google Nexus One . the unique AND fun part of this building is that its 3rd floor is connected with YongSan KTX Train Station to the South-East, the 2nd major Train Station for the bullet train KTX serving major cities in the West side of the Korean Penninsula . whole of this mammoth complex interwines several shopping malls and then in turn, accessible to the Shin YongSan Subway Station further South-East . department-store-like clean lingering shoppping surrounding found on the two building that form South-Eastern block (on my mini-map above) namely “JeonJaLand” translated as Electronics Land and “Terminal Sanga” synonym for the old “Bus Terminal Shopping Center”. then the wholesale-ish dirty, crammed buildings where workers swift around large boxes all-day-long . the former category above is geared to serve the general population who may work bank-hours or go to school and try to shop during weekends, so they are open on weekends . the latter is more for enthusiast where there are plenty in Korea, so this being part of their /business/ will shop mostly during office hours . thus these stores will close on Sundays . meaning, all the rest of the electronics-dedicated buildings such as (from West, clockwise) WonHyo SangGa, NaJin SangGa and SeonIn SangGa . this whole YongSan Electronics Market District is a Wonder whose heydays were after the 1988 Olympics amounting to the Millennium . but it is now meaningless to actually go “shopping”, for more precise price comparison can be done on-Line . unless you actually want to /feel/ a new product . over the Millennium when LCD panels were developing it was necessary to check for the dreaded ‘dead pixels’ but now not many are found, and manufacturers warranty effective enough they will exchange if it is in a sensitive position on screen . ( January 2013 Update ) after a full FOUR years since this original post : demographics of YongSan Electronics Market has evolved again some-what, again due to changes in On-Line Shopping Malls and Apple’s iPhone and iPads . and as I always believe in leaving records, here will add here below, instead of editing initial contents above . to minimize further confusion : will again explain geographically from West and going clock-wise . (1) JeonJa Land (Electronics Land) Main Building “bon-gwan” remains as the hub of home electronics, but fewer people come here when extensive price comparison can be had at On-Line shopping malls . but the New Wing connected to its West “shin-gwan” has change all-over, as related offices and support centers called A/S (for after-service) in Korean and an Apple shop and two of popular coffee shop branches on the ground floor . (2) WonHyo SangGa (Market) which consist of two parallel buildings running West-East : still holds as lighting stores on the ground floor of the front building, audio-system support centers on the second floor of the front building, and computer parts suppliers on upper floors of the rear building . but behind these two long buildings to its North, many offices of On-Line shopping malls selling electronics has set up in the several smaller buildings . (3) DooKkoBi SangGa (Toad Market) known for stand-alone game machines under-ground and digital cameras on the ground floor, all have taken a down-turn as smart-phones led by iPhone contain high-resolution cameras and have extensive games from their dedicated apps . (4) Najin SangGa (Market) consists of two buildings laying both North and South lanes of YongSan Electronics Market’s main road . again as home electronics suppliers on the ground floor of North Wing and radio communications supplier on the ground floor of its South Wing, with a maze of computer peripheral suppliers on both building rows upper floor . and behind further North from its North Wing awaits more local buildings where On-Line shopping malls who have survived the first boom, moved into . (6) Terminal SangGa (former Bus Terminal building) is now becoming laptop and notebook, aside from the few support centers on the upper floors . the ground floor is essentially a large hall, so the laptop and notebook stores are on the second and third floor, the latter more for selling AND buying used laptops and notebooks . ( July 2015 Update ) as noted above : YongSan Electronics Market became a full-fledged computer-assembly district in the nineties, then had its second tidal wave over the Millennium as Web-based On-Line stores (called shopping malls) flourished from preceding Cable-TV dubbed in South Korea as Home-Shopping, as a two-sided blade effect : visitors reduced drastically but the same products sold On-Line was distributed from here . it now expects a third major change as two new business may be added to its bordering iPark Mall, run by HyunDai conglomerate : a hotel complex built at the current site of former (out-of-city express) Bus Terminal, and a new Duty-Free Shop under bid . Official planners like to announce they ambitiously want this to compete with Akihabara Electronics District in the Capital of Tokyo in neighboring Japan . looking for electronics component stock offer supplier in Korea. I cannot tell you how many times I’ve visited your website since coming to Korea. This site has proven to be extremely helpful in finding my way around Yongsan and setting up my ipTime router – for that I wanted to thank you, Koreatech! I am an apple certified technician and need to quickly get my hands on an internal hdd cable for a mid 2009 macbook pro. 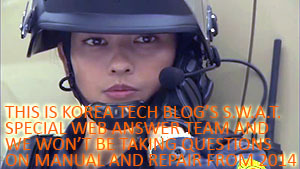 do you have any suggestions as far as who I could go to in Yongsan – or if I need to order the part online. I would really appreciate your input and direction in this seemingly endless sea of electronic stores! if this still don’t work : (Bus) Terminal Building 4th floor is THE Used Notebook Market, OR have a local friend search On-Line for “independent repairers” in Korean – which will show many, so choose one with a good mix of reviews AND your preferred location . I would like to purchase dash cam for cars (Lukas, Itronics, etc). Do you have any recommendation on where can I find them in Yongsan Electronics Market. Is there an area where most of these dash cam are sold? Thanks. I’m wondering where I would go to exchange my iPod bought a few weeks ago in the US??? I know I could ship it back to the US but if I could exchange it here it’d make my day! 2.or sell your USED one and buy a new one : Yes On-Line second-hand market is very active in the country with FAST internet connection, and iPhones and iPods tend to sell well and quickly if you go a bit under the going rate . but you’ll need help from a local since citizen or alien registration number is pre-requisite . a couple of local expatriate forum has buy-and-sell sections too, but will take more time though . – THIS BLOG DOES NOT INFORM EXACT POINTS OF PURCHASE NOR SALE FOR SEVERAL REASONS, BUT GOOD LUCK ! It looks like this blog is very helpfull. So, I would like to ask you if it’s easy to find shops in Seoul and Ulsan for used mobile phones of Samsung, HTC and Apple iphones free of cellular carrier contracts. I’ll travel to Korea early October. so, maybe it’s a good timing to get used iphones 5 since the model 6 is supposed to go to the market on middle of September. Also, I need to purchase a screen for my MacBook Pro. Is there any specific shops for this material? Please, let me know your tips and advises. Do you know where I can find wholesalers of USB drives. All sizes. minimum quantity of 500 pieces. Is there an area of seoul, like silicon valley, where I can visit a collection of USB manufacturers? I’m interested in buying original Samsung LCDs for all models. Do you have any suggestions how to do that in Korea? I shall be visiting Seoul in Dec-15..Wanted to know best place to buy Bluetooth Speakers…Which is the best brand available there and how much would it cost..
small vacuums, etc. Are they located in one or two buildings or spread out all over this market? or else would have to send it over via UPS . so better try first on hardware and electric stores in your neighborhood .